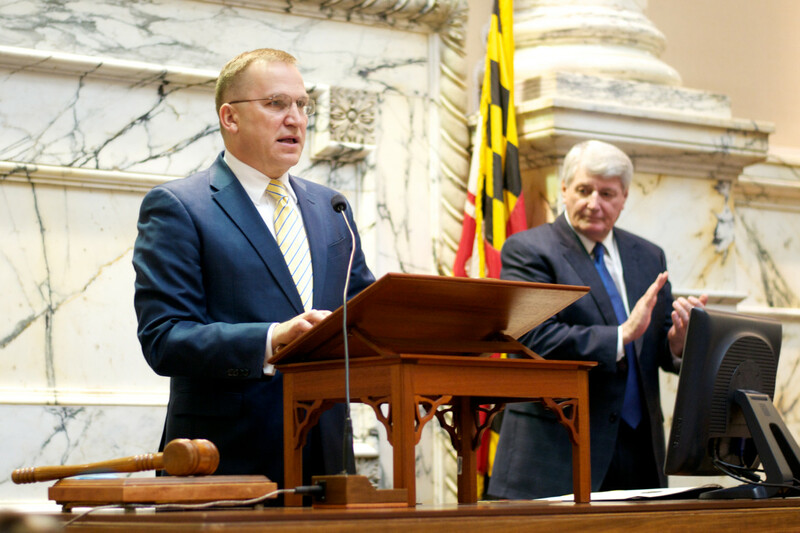 Photo above: Ukrainian Ambassador Olexander Motsyk speaks to the House of Delegates as Speaker Michael Busch applauds. The House chamber bustled Thursday morning as the first final-reading bills were given to Speaker of the House Michael Busch and the tally board began to light up green. Ambassador Extraordinary and Plenipotentiary of Ukraine to the United States of America Olexander Motsyk listened as delegates began their first bills for final passage on third reading this session, then gave a speech that blessed Maryland for its strong ties with the Ukrainian community. The speech’s positive energy seemed to brighten spirits. Delegates cleanly passed five bills, each receiving 137 votes with only one negative for two of them. HB10 Institutions of Higher Education, HB35 Hearing Examiners, HB37 Frederick Center for Research and Education in Science and Technology, HB115 Correctional Officers’ Bill of Rights, and SB22 Earned Income Tax Credit all passed. The last bill is an emergency Senate bill and the first sent by this legislature to Gov. Larry Hogan for his signature. It is a technical correction to specify that Maryland’s Earned Income Credit for 2014 taxes is 25% of the federal credit, a program designed to help the working poor who pay other taxes. The House bills now go to the Senate for action. Delegates let out a loud “Whoop!” for having wrapped up the first-third reading this 2015 session.